Scenario 1: simple.examplesite.tld is already running on a different server or is not running anywhere yet. 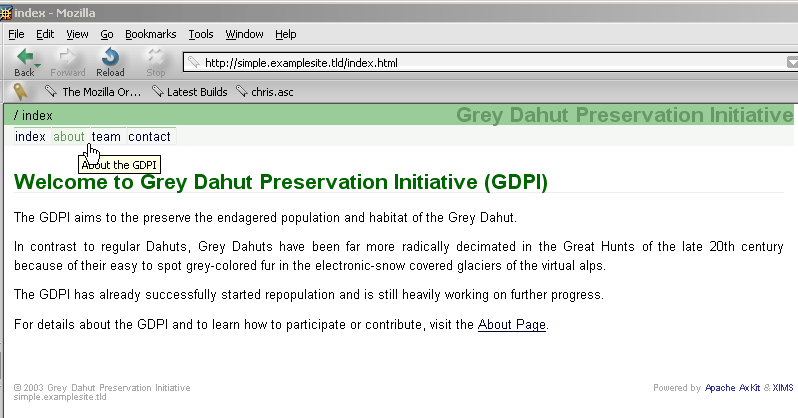 For demonstration purposes, we will build an example site for the Grey Dahut Preservation Initiative (GDPI). Sample content for that site is provided in the examples directory of the XIMS distribution in simple.examplesite.tld. Note: the script assumes that the password of the admin user is still the default password which is set after the XIMS installation. If you have changed that, you have to adapt the script. Now, as we have got some content to work on, we need the users to get access to it. We will start out with creating a role for the Grey Dahut Preservation Initiative (GDPI) called GDPI. Log in to XIMS as admin user and click on "Manage users and roles" at the "Administrative Options" section of your start page. At the "Create User" screen enter GDPI" as name of the user, "Grey Dahut Preserv. Initiative" as full name and set the "Account is an Abstract Role"-option to "yes". After the role has been created, click on "Grant Role" and grant it the role "everyone". After going back to the User/Role Management screen, click on "Bookmarks" for the newly created GDPI role. The path to the default bookmark is /simple.examplesite.tld in this case. Before clicking on create, do not forget to set the new bookmark as default bookmark. The default bookmark will be inherited to all users of the GDPI role. Back in the User/Role Management screen, we will create a user called bender for the president of the GDPI and grant it the GDPI role. You can move on to section Publish Site if you did not import your content using fs_importer.pl but created it using the web interface. This will set the owner, creator and last modifier of all 16 objects at /simple.examplesite.tld to the user bender. Note that set_user_metadata.pl requires XIMS admin privileges to run. Note: MODIFY is a shortcut for the VIEW, WRITE, DELETE, ATTRIBUTES, TRANSLATE, CREATE, MOVE, LINK, ATTRIBUTES_ALL, DELETE_ALL, GRANT, GRANT_ALL, and OWNER privileges. After granting to the user bender, we want to grant VIEW privileges to the GDPI role, to let other possible future grantees of GDPI see the content. Later, Bender can manually grant other privileges besides VIEW to members of GDPI. After you have created your initial content base, you may want to see how it will look like after it has been published. Per default, the XIMS config option ResolveRelToSiteRoots is set to '1'. As a consequence, all published XIMS internal references are created relative to the SiteRoot instead of being published relative to '/root'. For example, the link to the ObjectRoot settings file ou.xml created during export in the published version of index.html, like in every Document, will be set to '/ou.xml'. If ResolveRelToSiteRoots would be set to '0', the link to ou.xml would point to '/simple.examplesite.tld/ou.xml'. As ResolveRelToSiteRoots is set to '1' per default, you are expected to set up Apache virtual hosts for every site and direct the SiteRoot URLs to the according addresses. During the development of your site's content, you surely want to already test and develop the navigation- and styling- elements of the site. To avoid adapting paths to stylesheets in the Apache AxKit server configuration and to avoid adapting paths inside your stylesheets, which would have to be changed from /ximspubroot/simple.examplesite.tld/stylesheets/default.css to http://simple.examplesite.tld/stylesheets/default.css for example, you have the option to locally use the future live SiteRoot URL or a temporary staging URL. Note: You can use the sample Apache config provided in the examples directory of your XIMS installation for that. Just add the line "Include /usr/local/xims/examples/simple.examplesite.tld-httpd.conf" in your httpd.conf. To point the users to the correct URL of the staging server, you have to change the SiteRoot URL accordingly. The SiteRool URL http://simple.examplesite.tld, set by import_publish-simple.examplesite.tld.sh, must be changed to http://staging.examplesite.tld in our example. Note: If you included /usr/local/xims/examples/simple.examplesite.tld-httpd.conf as described in the note above, AxKit will already use /usr/local/xims/examples/simple.examplesite.tld-axkit.conf and you do not need to create an extra conf/simple.examplesite.tld.axkit-conf. PerlSetVar AxAddXSLParamGroups "Request-Common HTTPHeaders VerboseURI"
Warning: If publisher.pl does not have the setuid flag set, you can only use publisher.pl as superuser or as an user with write access to the ximspubroot directory respectively! From the administrative point of view, there is little to do to go live now. With the above mentioned scenario 1, the only thing to do is to change the DNS entry for the old simple.examplesite.tld to point to the new XIMS powered host. If you have a set up similar to the one described in scenario 2, you have to change two things to go live: First, adapt the name of the virtual host in the Apache config to the name of the final production server, simple.examplesite.tld in our example. And second, update the SiteRoot URL inside XIMS accordingly. In our example, that would mean changing http://staging.examplesite.tld back to http://simple.examplesite.tld again by editing /simple.examplesite.tld.